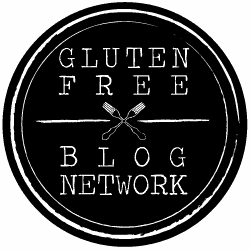 You are here: Home / gluten free entrees and meal recipes / gluten free dinner recipes / Asian Peanut Butter Chicken Lettuce Cups AND Pacific Beach Peanut Butter Review! 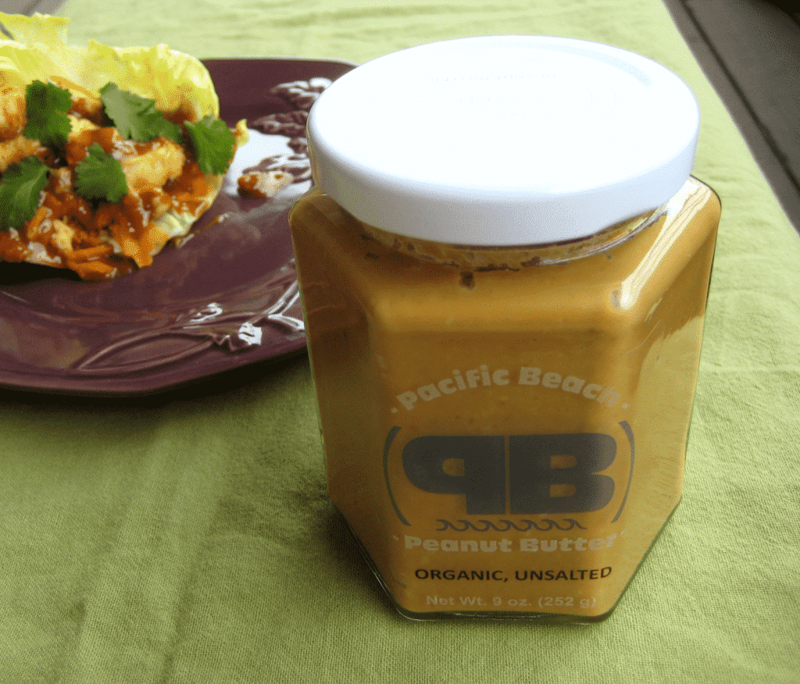 Asian Peanut Butter Chicken Lettuce Cups AND Pacific Beach Peanut Butter Review! So exicted that I am taking a break from crazy packing right now to share it with you, instead of waiting until we are settled in our new home next week. I absolutely loved the texture of the Pacific Beach Peanut Butter. I tried the Organic Unsalted Peanut Butter, the Butterscotch Peanut Butter Spread, and the White Chocolate Peanut Butter Spread. 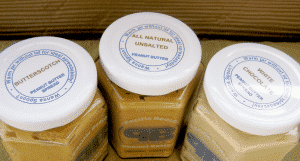 The texture of all of their peanut butters was not quite crunchy, but not quite smooth. It is creamy and the peanuts are ground just enough to still have a bit of texture to remind you that you are eating real peanut butter. The Butterscotch Peanut Butter Spread was perfect in some monster cookies! The butterscotch stood out in the monster cookies but I found that in some of the other baking applications, like No-Bake-Cookies, the butterscotch was too subtle and got lost a bit. That wasn’t so much a problem though when I just used a spoon. 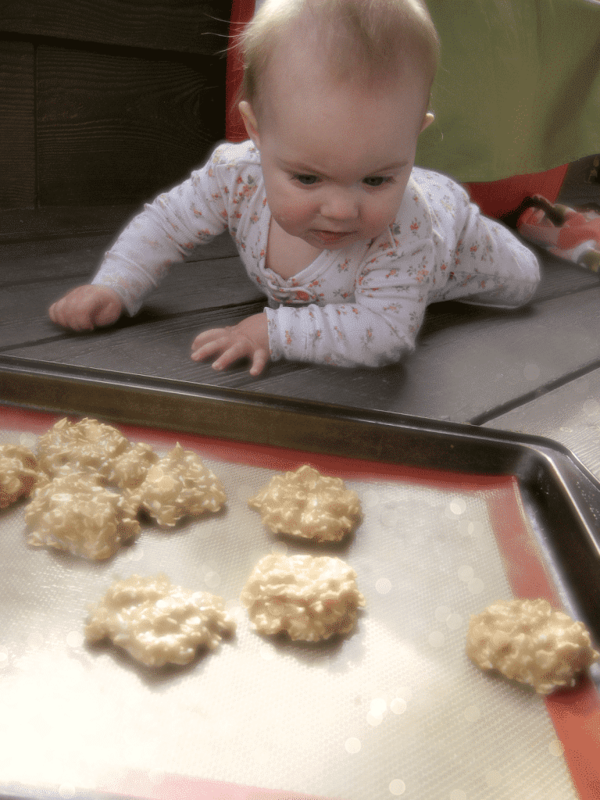 Baby E really wanted those cookies, she got so mad when I took them away. This was the one hour out of the whole week where she felt good; she had been sick all week. And then mommy wouldn’t give her a cookie! I can’t wait to try some of their other flavors! The Chocolate Raspberry Peanut Butter Spread and Cinna-Yum Peanut Butter Spread are especially tempting. 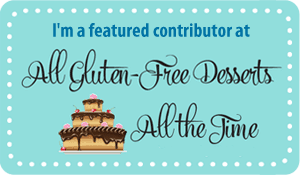 So hurry and order your peanut butter and use offer code:blogger03 to get a free jar of peanut butter with your purchase before it expires on 4/15/13. Toss the diced chicken with the ginger, onion powder, red pepper flakes, and garlic powder. To the skillet used for cooking the chicken add all of the sauce ingredients and heat over low-med heat until the sauce is smooth and heated through. Adjust the thickness of the sauce with a little bit of water so that it has a nice, pourable consistency. Serve the chicken in the iceberg lettuc leaves, top with cilantro and drizzle (or dip) with the peanut sauce. Disclaimer: I received products from Pacific Beach Peanut Butter to facilitate my review. The opinions above are my own and were not influenced by receiving free products from Pacific Beach Peanut Butter. Congrats on the new home! I adore peanut butter and a good peanut sauce so this looks awesome!! Thanks Sarah! We are finally starting to settle in. This was so tasty I think I’m going to make it again for dinner this week. Yum!